Brownie’s Floating Hookah Diving Systems offer the freedom to dive when and where you want without the use of conventional scuba equipment. By replacing bulky scuba tanks and traditional buoyancy compensators with Brownie’s Drop Weight Cummerbelt™ and float-mounted compressor, divers can enjoy hours of fun exploring the underwater world. In fact, the Brownie™ offers divers approximately three hours of air on less than one gallon of gas, less than the cost of filling a single scuba tank! The new electric Third Lung is even more efficient. 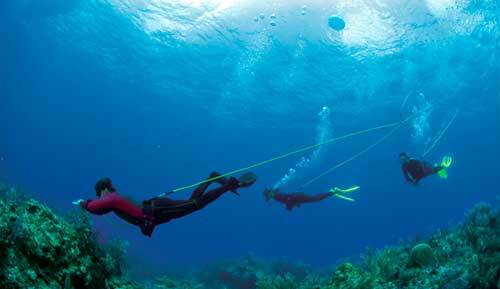 Brownie’s Floating Hookah Diving Systems can support as many as 3 divers to depths of up to 90 feet. Add-A-Diver Kits that allow an additional diver to participate are available through your local dealer. In addition, Brownie’s will provide online training with the purchase of each recreational hookah system. This training program makes the necessary information for safe use of the equipment easy, convenient and fun.